You are running out of disk space on the Local Disk (G:). Where G: is the troublesome drive. No matter the other drives might have a lot of free space, this error message would keep popping up every time you try to delete it. A known cause is that a Window update revealed the recovery partition and assigned it a drive letter. The reason this problem is so bothersome is that we cannot delete the recovery partition since it is crucial to the system. Even more, the extra partition might use system resources and slow it down. Thus, our approach towards finding a resolution would be to change the Drive letter and not delete the drive itself. 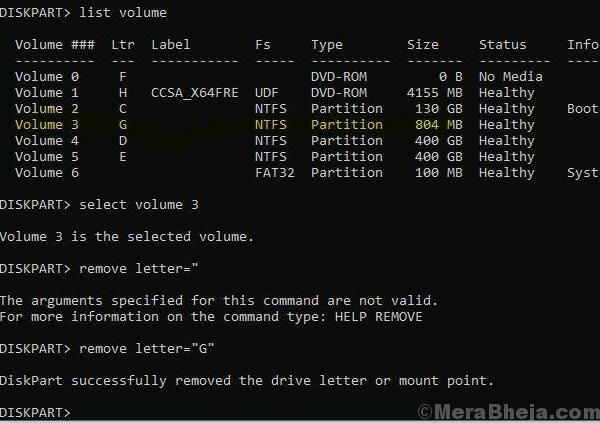 How to remove the Drive letter? 1] Press Win + R to open the Run window and type the command cmd. Hit Enter to open the Command prompt window. 2] Type the command diskpart and press Enter. 3] Type the command list volume and press Enter. It will display the list of partitions on the systems. 4] Type the command select volume G: and press Enter, where G: is the drive letter. 5] Type the command remove letter=G: and press Enter, where G: is the drive letter. This helps remove the drive letter. This troubleshooting was referred from a discussion on the Microsoft Answers forum which could be checked here.